San Jose State University is pleased to host the 2019 NCWCA Conference. Visit our website to review the CFP and submit a proposal: sjsu.edu/ncwca. Proposals are due January 14, 2019 by midnight PST. 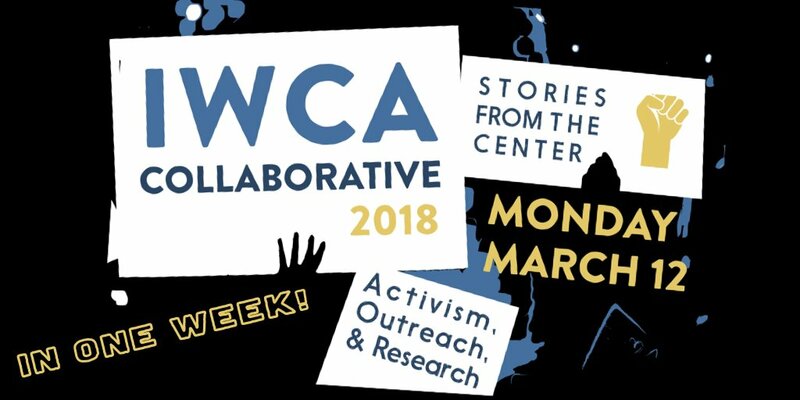 Register today and join the presenters and other participants from 4 different countries and 20 different states as we embark on the first-ever #IWCACollaborative online event. Please register by Friday, March 9th, so we can send you log in and set up instructions for joining us in the Adobe Connect meeting space before Monday. Registration is only $30 and with it you also get exclusive post-event access to the recorded sessions. That means you can watch on demand sessions you missed and attended! See you Online in Realtime! Friday, February 23, 2018, 3:00pm to 4:00pm E.S.T. This event will cover WLN’s process of publishing, scholarly genres, and other information, hosted by WLN Associate Editors Elizabeth Kleinfeld, Julie Prebel, and Sohui Lee. There will be opportunities for Q & A. If you’ve thought of submitting to WLN, this is an excellent opportunity to hear from us on the process. The webinar is free, but please R.S.V.P. at: https://www.eventbrite.com/e/introduction-to-publishing-in-wln-a-journal-of-writing-center-scholarship-tickets-41031721985. There’s so much joy in our work: Why not share it? #WCjoy is a brand-new, bi-weekly twitter chat (Thursdays, 8 PM, EST), wherein WPAs, tutors, composition instructors, writers, etc. are invited to share their anecdotes, quotes, memories and various ways of expressing the joy we find in Writing Center work. The #wcjoy chat seeks to create an informal but still organized space for WPAs to meet, make friends, and experience a positive sense of community together. Follow others from the chat! Make friends! We are, quite literally, here for that reason. The #wcjoy chat seeks to encourage WPAs, etc. to carve time out of their busy workweeks for mindfulness and reflection on the very moments and people who make our work so wonderful. This type of attention fosters gratitude, and gratitude in turn fosters joy. Each bi-weekly session, questions will be posted to Write Centered Monday of that week. At 8:00PM on Thursday, @write_centered will tweet out a welcome. Follow the Chat Norms below for the rest. Always use the hashtag #wcjoy to keep us organized! Users who attack or harm others will be blocked by participants. Use the #wcjoy tag OFTEN and WELL! No need to reserve use for just the chat. If you can’t attend the chat on time but want to answer questions, that’s totally cool. Just follow the chat norms, so we can still trace where you’re coming from and where you’re headed in your replies. In the past decade, the Secondary School Writing Center (SSWC) movement has gained tremendous momentum and traction, and perhaps no region has seen such rapid growth in the establishment of SSWCs as the greater Washington, D.C. area. When I became co-director of the Herndon Writing Center in 2012, I was excited about what our center could do within our school. 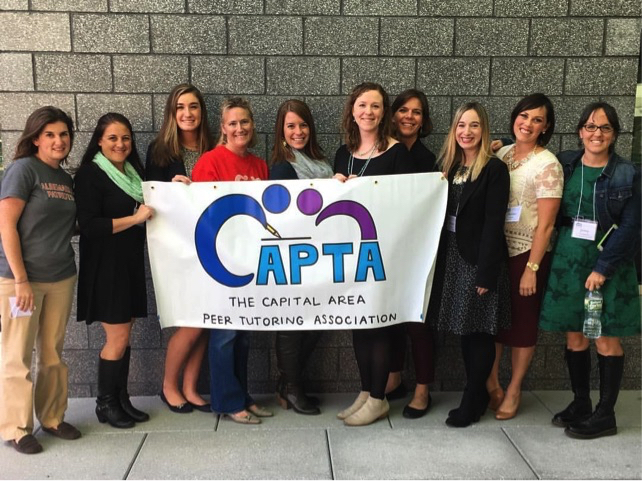 It wasn’t until I became involved with the network of SSWCs that eventually became the Capital Area Peer Tutoring Association (CAPTA) that I recognized how important it is for me to engage in a professional community dedicated to celebrating and supporting the work that SSWCs do. 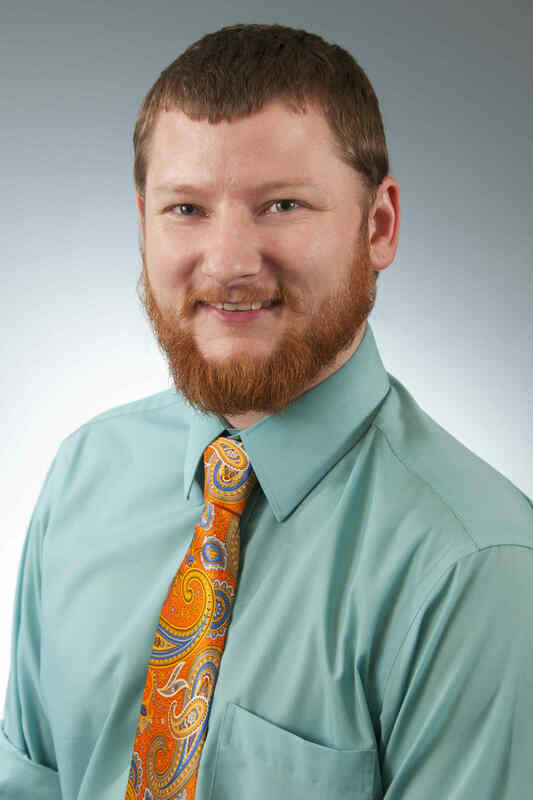 In an effort to highlight the ways in which CAPTA has unified and amplified the voices of SSWCs, I reached out to long-time and new CAPTA members to ask them to share how our network has helped them to legitimize and sustain the work we all do in our SSWCs. In 2014, six SSWC Directors—Amber Jensen of Edison High School; Beth Blankenship of Oakton High School; Alison Hughes of Centreville High School; Jenny Goransson of West Springfield High School; Hannah Baran of Albemarle High School; and me—officially founded CAPTA, an organization dedicated to building community among, promoting advocacy for, and supporting the development and sharing of resources for new and existing SSWCs in the greater Washington, DC, area. While many of us acknowledged the need for and sought out opportunities to connect with other university writing centers around the country via existing peer tutoring networks, we quickly realized that SSWCs, their directors, and their tutors faced challenges and opportunities unique to the world of secondary schools. CAPTA was born of the need to create a sustainable network that specifically catered to our needs, that legitimized our work, and that encouraged scholarship in the field of SSWCs. Janice Jewell, founder of the Herndon Writing Center, reflects, “The creation of CAPTA gave a wider sense of legitimacy to the fledgling writing centers. I think that as centers become established, participation in CAPTA normalizes these programs, so that once established, they become part of their communities, and the impulse to do away with them can subside.” As a diverse group of directors from schools with diverse needs, the formalization of the CAPTA network helped us to establish norms and identify our own best practices for sustaining successful SSWCs. Trisha Vamosi, Director of the Eagle Writing Center at Osbourn High School in Manassas, VA, and CAPTA’s website curator, has found “the resources and guidance from other directors to be overwhelmingly supportive. 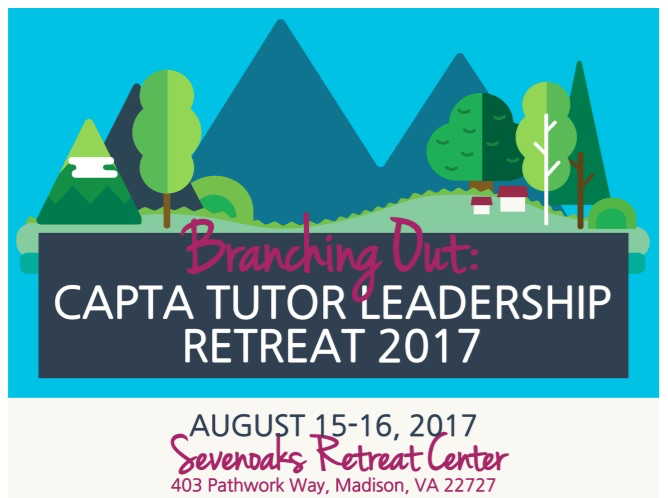 CAPTA has provided not only an irreplaceable resource toolkit, but a space inviting constant networking” among directors in the field. SEEKING YOUR RESPONSE: How Are Writing Centers Working Out within Learning Centers? 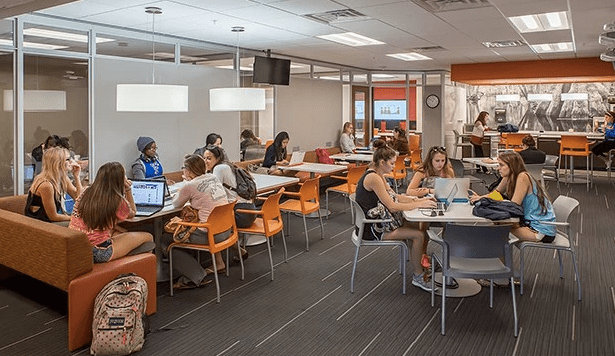 More and more writing centers now exist within or are moving into learning centers (or Student Success Centers or Academic Skills Centers, or whatever name they are given), but how are they faring? This complex question needs to be explored from numerous perspectives and by numerous voices, so we at WLN have decided to ask you to identify problems you’re solving and write about positive aspects of existing within a learning center and how you achieved success. What wisdom, insights, solutions can you pass along to others? What are conditions that could prove to be problematic? Consider your audience as other writing center directors who are wondering how to fit in or improve their writing center and want to learn from colleagues who have clarified problems and found solutions. This will be a collaborative effort of as many voices as we can fit in to an issue of WLN: A Journal of Writing Center Scholarship. Karen Johnson, Associate Professor at Shippensburg University, and Ted Roggenbuck, Associate Professor at Bloomsburg University, direct writing centers in the same state system. Over the past several years, they have collaborated to develop cross-institutional trainings and research. 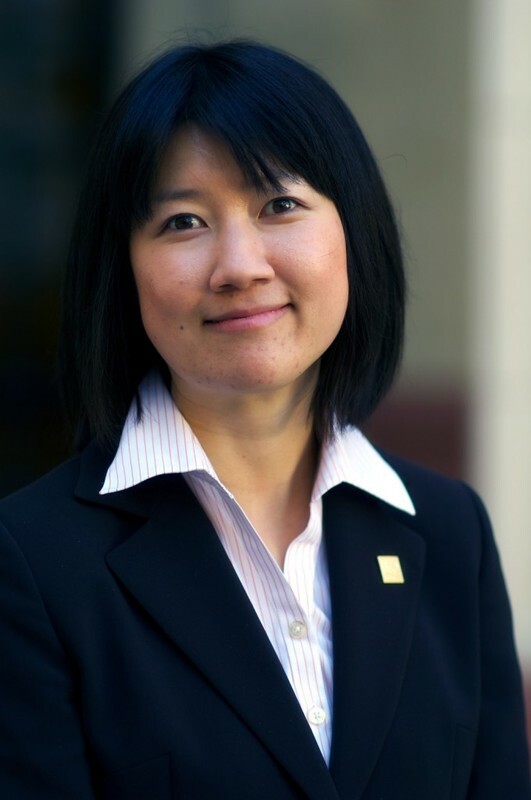 Their ongoing discussions and scholarship about educating writing tutors span several publications, conferences, and workshops, piquing their thirst for topics surrounding tutor education. 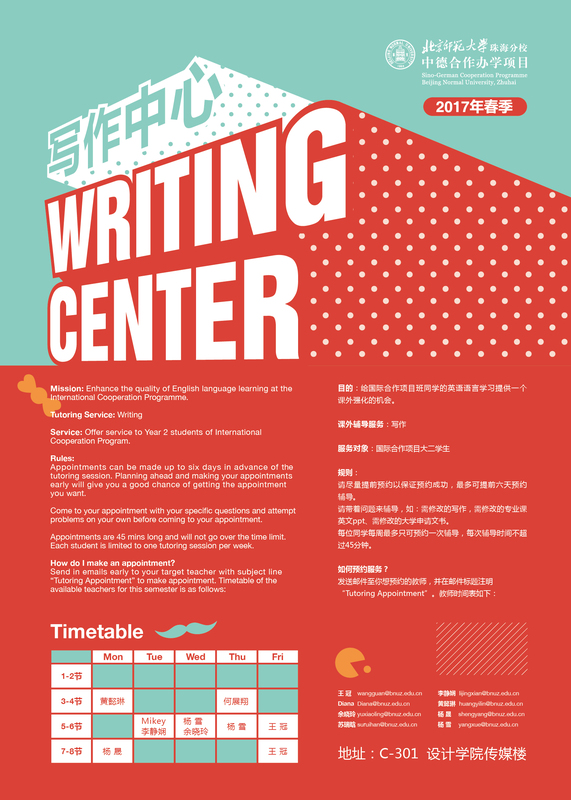 Key to our success in the important work of writing centers is our effectiveness in providing tutor education. Our field has over three decades of scholarship on how to educate writing tutors in a multitude of settings, but the wealth and variety of resources can create challenges for those seeking guidance. However, that we also have a number of excellent and popular (though not universally used) resources such as The Bedford Guide for Writing Tutors, The Longman Guide to Peer Tutoring, and The Oxford Guide for Writing Tutors does suggest at least some consistency in how we educate tutors. But to what degree do we share core beliefs about tutor education, how do we know what aspects of our programs to prepare writing tutors are most effective, and to what areas are we not paying adequate attention? Moreover, what are effective contexts for educating tutors? Although credit-bearing courses appear to be ideal contexts for tutor education, what particular aspects of a course make it effective? And for directors who are unable to offer a course or even paid time for educating tutors, how can they effectively prepare tutors for the different rhetorical situations and writers they will encounter? 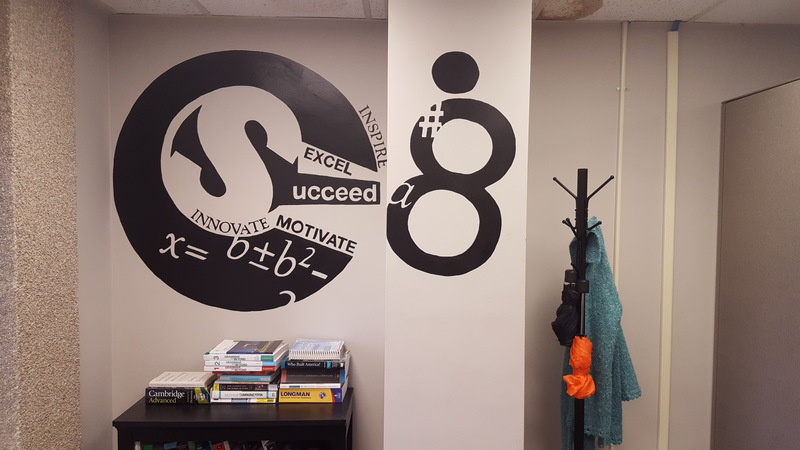 Editor’s Note: Today’s guest post is from Matthew Kemp, the Writing Student Services Coordinator at the Learning Center at Auburn University at Montgomery, sharing how they teamed up with student artists to create murals in their tutoring space. A communal coffee pot (or perhaps a Keurig), grammar textbooks, computers, loose leaf paper: things you’ll probably find in writing centers from Texas to Toronto and beyond. Recently in the WCENTER listserv, a question arose regarding ways a new director could decorate his/her center. Of course, there are many ways to answer this question, and many answers were offered: posters, chairs, rugs, paintings, local newspaper articles. However, the suggestion that struck a chord with me was student art. You see, my multidisciplinary center has three large murals painted on our walls, and all of them were designed by students for a Typography course. My center uses these murals as ways to brand ourselves on campus. They represent our mission as well as our values to students, and we absolutely adore them. So how did my center come to have these large murals? I can tell you with certainty, it wasn’t originally our plan! A few years ago, my center relocated from a small room in the nursing building to the second floor of our library tower. We filled our new space with the typical items from above. It wasn’t unlike many other centers across the world: computers, funny memes pinned to the walls, pencils, and scratch paper. The idea of murals never entered our minds. That is, until we saw our student phone operator, a graphic design major, working on some homework for her Typography course. The assignment asked students to sketch and alter letters and numbers. As our center is a multidisciplinary office, the sketches of various letters and numbers seemed to be a perfect way to illustrate what we did. We asked if she thought her class could do a mural in the same vein as her homework. She was delighted at the prospect! So our director contacted the Typography professor and told her our idea. Editor’s Note: The University of British Columbia in Canada, which has an enrollment of about 60,000 students, is planning on closing its Writing Centre. 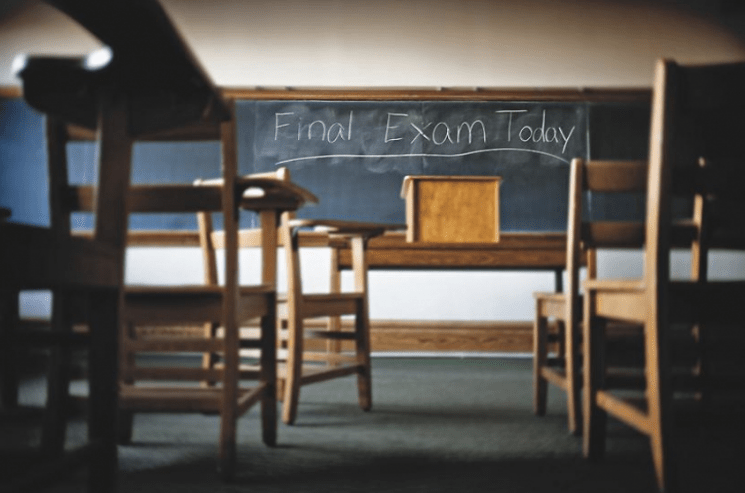 Tutors have been fighting to prevent this closure. 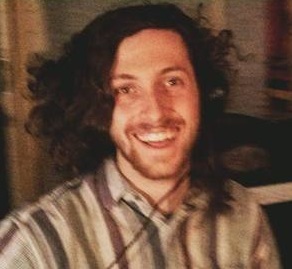 We interviewed a UBC Writing Centre tutor, Cole Klassen, about current and future efforts to fight the closure of the Writing Centre. You can find our initial post on the UBC Writing Centre closure here. To show your support for keeping the UBC Writing Centre open, you can sign this petition! Hi Cole! Can you tell us about your studies at UBC and your work at the Writing Centre? I transferred from Douglas College to UBC last summer. I’m just finishing my third year. I am in the creative writing BFA program and I am minoring in philosophy. I’ve worked at the UBC writing centre since the start of the fall semester as a peer writing tutor. I began tutoring at the Douglas College Learning Centre, where I worked as an online and face to face writing and content peer tutor for two years. Who is involved in the efforts to keep the UBC Writing Centre open? What have you done so far? Special Announcement: Introducing WcORD of the Day! 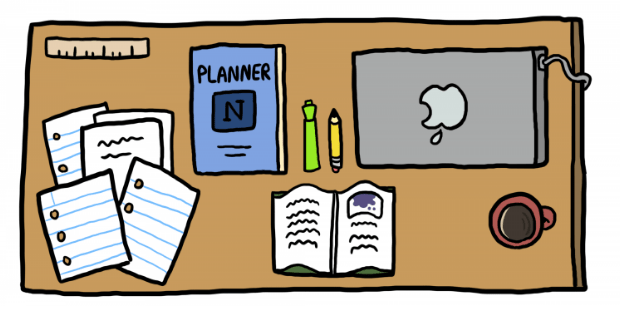 This Facebook page, curated by Patrick Hargon, shares daily posts from WcORD, a searchable database of writing center resources. WcORD invites all members of the writing center community to add their own resources and share the database on their websites and social media outlets! Rose Richards (Stellenbosch University, South Africa) last reported to us about the South African Writing Centre’s group. Here she fills us in on this summer’s national writing consultants’ day! 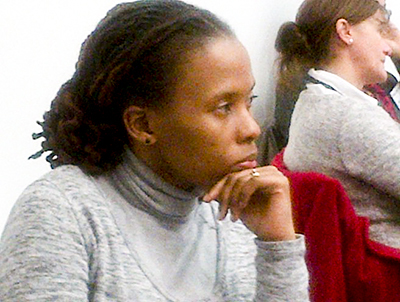 On 30 July, 2015, Stellenbosch University Language Centre hosted the first South African national writing consultants’ day. Writing consultants from 11 South African universities participated (Stellenbosch, University of Cape Town, University of the Witwatersrand, University of the Western Cape, Cape Peninsula University of Technology, University of Johannesburg, University of Pretoria, Walter Sisulu University, Durban University of Technology, University of South Africa and Nelson Mandela Metropolitan University) and an observer from the National University of Lesotho. We had a full schedule of presentations in which consultants shared their work experience and practise. Participants described Consultants Day as “a superb and very worthwhile event” (Brenda Vivian, University of Pretoria), “informative” (Taahira Goolam Hoosen, UCT), “a turning point for consultants/ peer tutors nationally as it recognized and validated their experiences” (Laura Dison, Wits), “a delightful treat as well as an educational and interesting journey” (Zandile Xesha, Wits), “eye-opening” (Lisa Weideman, NMMU) and “warm and collaborative” (Ben Saxby, Stellenbosch). Jill Gladstein and her crew at the Swarthmore College Writing Center share an update about the #IntlWrtIn initiative! Cram Jam”, “Writers’ Block Party”, or “Final Paper Countdown”– International Write-In events may go by many names, but all share one goal: to unite student writers to remind them that they aren’t alone with their writing. 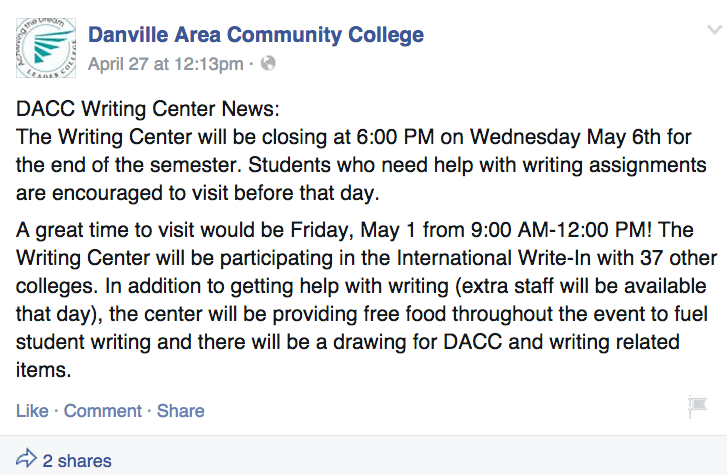 After a successful first run in December that saw over 1000 students come together on 27 college campuses and across social media for a week of writing events, the Spring 2015 International Write-In has become even bigger, with 44 colleges and universities participating between April 24 and May 5. This semester’s group includes a variety of institutions spanning Community Colleges, SLACs, HBCUs, and R1s, each providing writers with a space to come together to write. Participants have been connecting via Facebook, Twitter, and Instagram with #IntlWriteIn, and will continue to do so throughout the event. Swarthmore College’s Writing Associates Program is proud to have helped sponsor the Spring 2015 International Write-In by connecting participating colleges and universities online. For more information, please check out the International Write-In webpage. After successful colloquia at AILA and AAAL on global academic publishing, Theresa Lillis and I are pleased to issue this call for proposals to contribute a book chapter to an edited volume to be published by Multilingual Matters: Global academic publishing: Policies, practices, and pedagogies. Proposals due to mjcurry@warner.rochester.edu by June 15. Details included in the call for proposals, below.